From understanding social attitudes towards climate change, to mapping how climate change is reported in the media, our research seeks to encompass the complexity of climate change communication in Australia in order to improve the climate literacy of Australians. Through aggregating existing social research on climate change and conducting new research in identified gaps, our work supports and builds media and policy infrastructure that adequately addresses climate change in Australia. This report examines the formation and impacts of Cyclone Debbie, the most powerful storm to make landfall in Queensland. It also explores the details that emerge after sonifying the storm, a process of taking data collected every 6 hours from Debbie’s formation and creating an audio track representing the storm's latitude, longitude, circularity and central air pressure. This report is the second in a series of reports examining how renewables are discussed in Australian newspapers, with a particular focus on the Snowy Hydro Project. It highlights the major role that corporate ownership of newspapers has on the editorial discussion of renewables. This survey details the results of a collaborative study between Monash University and the City of Monash in which 457 residents were interviewed to understand the motivations and barriers that households experience with regards to installing renewable energy in the home. 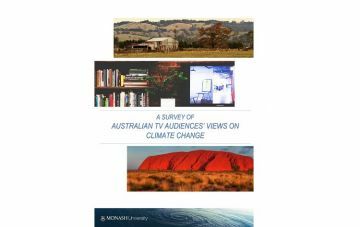 This report documents the findings of a national survey of TV audiences’ views of climate change in Australia. 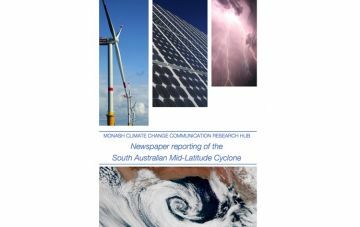 The survey sought to evaluate the receptiveness that Australian television audiences have for adding climate change information to weather segments of news bulletins. This report is the first of a series examining the way that climate change is reported on in relation to extreme weather events. It examines the mid-latitude cyclone that damaged infrastructure in South Australia on September 29 2016, causing a statewide power blackout when it brought down 22 transmission towers. This report documents the initial findings of the first Australian weather presenters survey. The survey sought to understand the collective attitudes of the Australian weather presenting community in relation to climate change, and gauge their interest in delivering climate information in their broadcasts. These reports examine the views that Australian capital-city television audiences have on climate change and their interest in having climate information delivered to them in broadcasts.